The Reader Bee: 500 Follower/Blogoversary GIVEAWAY!!! I have officially reached 500 followers on my blog. I AM AMAZED at this! :) Thank you all SO much! It's also almost my 6 month Blogoversary! to all my amazing new friends! I will choose 3 winners, each winner will have the choice of ONE book from the list below. Winners will be chosen via Random.org, and will be contacted via email. If the winner does not respond within 24 hours, a new winner will be chosen. This giveaway has now ended! Winners will be chosen soon. Thank you for participating! Awesome giveaway! I love your blog, and I hope this is only the beginning for you! Congrats on so many followers, that's amazing! Thank you so much for such an awesome giveaway. Thanks for the great giveaway. It is very nice to make it international ! I haven't read these books but I'm dying to so it's a great opportunity ;) ! Congrats on all your followers and thank you for the giveaway!! You are fabulous! I love reading your blog and I look forward to doing so for much longer! Congrats on the followers and on 6 months! Our blogs were born at about the same time!!! Wow! Congrats on the followers & thanks for the giveaway!! Wow congrats on reaching 500 followers in 6 months! That is a great accomplishment. :) Thank you for the chance to win! Congrats on reaching over 500 followers! Thanks for the giveaway! Congrats on the 500 followers. And thank you for the awesome giveaway. fab giveaway and a great choice of books. Wow, congratulations! And thank you for the giveaway! I really want to read each one of these books! Congrats on your 6 month blogoversary and getting to 500 followers! Congratulations on all the followers and for blogging 6 months!!! THank you for the amazing opportunity! Thanks so much for the giveaway! Congratulations on the followers and blogoversary - that's awesome :) Seriously want to win Hourglass.. Thanks! i love the design of your blog!! it's soooo simple, yet elegant!!!! thank you for this fantastic giveaway!!!!! Great contest! Congratulations on achieving this milestone! Congratulations on 500 followers! Though, they're actually 628 right now! The three winners are going to have a tough choice to make! 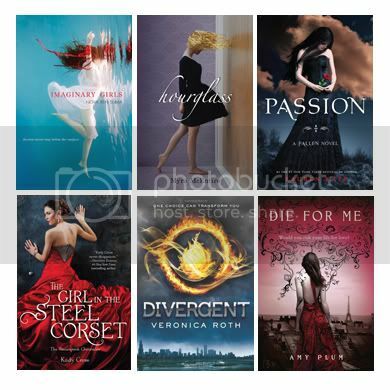 I already have Divergent, so ideally, I would like all five of the others! Wow, huge congrats to you! Here's to many more anniversaries and followers :) Thank you for the giveaway! Thats awesome - really a milestone! Congrats and happy anniversary! Happy 6 month blogoversary! And look! You're almost to 700 followers! Congrats on your blogoversary and thanks for the awesome giveaway!!! Congrats on all these followers!! Thanks for the giveaway! Awesome giveaway! New follower here :D Hugs and congrats for reaching so many followers!